Running out of wrapping paper this year? 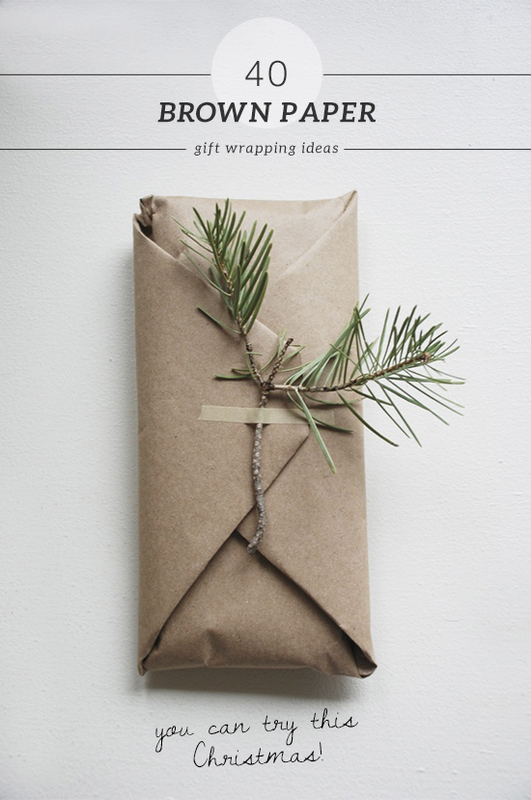 Thankfully, the internet won't let you run out of wrapping ideas too, as long as you have a few meters of basic brown kraft paper in your hands. There are tons of amazing holiday wrapping diys out there (you know, pinterest, ahem) but I thought I'd sum it up a little for you. So, here's a post with 40 of the most inspiring gift wrapping ideas that got my attention lately, you can do all by yourself or with your family. Most of them require basic everyday objects you'll most probably have at home or a small visit to a near park ;) Go ahead, have a look and tell me which of the following ideas you're most likely to follow! Hand-drawn & Stamps: 21.Painted stripes by Live laugh rowe, 22.Homemade holiday gift wrap by Eat sleep cuddle, 23.Stamped kraft paper wrapping by Genine's art blog, 24. Evergreen stamp and neon masking tape by Vorstellung von schön, 25.Hand-drawn gift wrap by Minieco, 26.Hand-stamped kraft paper in red by Duni's Studio, 27.Reindeer silhouette stamp by Chelsea Costa via Poppytalk, 28.Chalk pen calligraphy by Anna Taylor, 29.DIY polka dot kraft paper wrapping by Factory Direct Craft, 30.Glitter dots and stripes by C.R.A.F.T. 8 comments on "40 brown paper gift wrapping ideas"
Beautiful! Love love the wrappings you have. I us right up my alley. These are great, handmade wrapping is so much more personal & shows the thoughtfulness you put into the gift. I totally will try some of these ideas. Great ideas! Love the style! I love brown paper too. It really looks beautiful under the tree. And when stumped too :) Lovely photos! These are absolutely wonderful ideas. I actually bookmarked this so I can get ideas when wrapping gifts not just this Christmas season. I can't get the paper to stay without using a ton of tape. =( But I like the way it looks other than that. And it was fun painting it. I love this idea for Christmas. I don't have to worry about buying paper for the holidays and I can add my own art to it. Thanks for sharing!